We have discussed overall strengthening poses before in the blog, but today we are going to focus on core strength. Core strength is important for maintaining proper alignment throughout your yoga practice. Strengthening your core is also going to help you maintain proper posture as you go about your day. If you have a home practice, try including these poses in your routine. Knee to Nose Downward Dog. This is a variation on the usual pose. From downward dog, bring your feet close together. Lift onto your toes and shift your weight slightly forward to round the back as you hug your right knee as close to the chest as possible. Hold for 10 seconds and switch legs. You will feel your abdominal muscles working to hold your leg close to your chest. 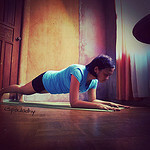 Forearm Plank. From your hands and knees, lower your forearms to the mat so that they are parallel to each other, fingers spread wide. Extend one leg back, balancing on the ball of the foot and then do the same with the other leg. Make sure your hips stay in line with your shoulders. Pull your bellybutton in towards you spine. Don’t forget to breath! Hold the pose anywhere from 10 seconds to 1 minute. Triangle. I often think of side plank as one of the best poses for strengthening the oblique (side) abdominal muscles, but Triangle pose can also be a great oblique strengthener. The key is not to let the weight of your torso fall into your bottom hand. (This hand is likely resting on your shin.) The more you use your oblique muscles to keep your torso lifted, the more effective this pose will become for your core strength. So, just lightly rest your hand against your shin or even open the palm and hold it to the inside of the calf, palm facing away. Hold the pose anywhere from 10-30 seconds, and switch sides. Locust. Sometimes we forget that our core is not just the abdominal muscles, but also the muscles supporting our core from the back! This pose is perfect for activating the muscles on the back of the body to even out your core strength. Lying on your belly, bring your arms along side your body and separate your feet hip distance apart. Keeping your gaze down towards the mat, lift your head and chest off the mat. At the same time, lift your arms and legs off the mat. Imagine your are reaching back with your fingertips and toes. Hold for 10-30 seconds, then relax back down to the mat. Repeat the pose 1-2 more times. Boat. This is one of the more challenging strengthening poses. From a seated position with both knees bent and the feet flat on the mat, extend your arms alongside your legs. Lift one foot so your shin is parallel to the mat. Try to keep your bellybutton pulled in towards the spin and the chest lifted. Lift your other foot off the mat. Hold the pose for 10-30 seconds and rest. Repeat once more.